This entry was posted on Tuesday, March 3rd, 2009 at 4:38 am	and is filed under My Family, Pudding. You can follow any responses to this entry through the RSS 2.0 feed. You can leave a response, or trackback from your own site. My office mate, Cara, thinks of you as a female Elton John who can cook. Kudos on your Yankee Magazine debut! Elton John, huh? Must be the glasses; I’ll have to wear them more often! 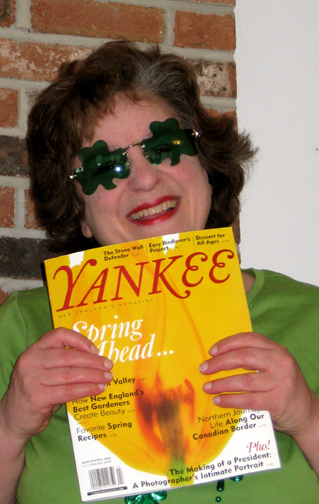 Congrats on Yankee mag! Great coverage and you’re famous!! !